The World of Coca­Cola is the only place where visitors can explore the complete story—past, present and future—of the world's best-known brand! Around every corner you'll experience something new and inviting. You will see great new interactive exhibits such as a thrilling, multi-sensory 4-D movie and a fully functioning bottling line. You can even meet our 7-foot polar bear! And of course, a World of Coca­Cola favorite—the tasting experience, will provide visitors with a refreshing opportunity to sample up to 70 different products from around the world. All this and much more make the NEW World of Coca­Cola a unique and must-see Atlanta experience! 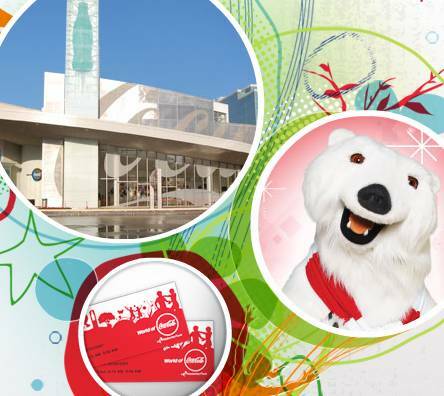 The Coca­Cola Store is a part of the NEW World of Coca­Cola experience, but you don't need a ticket to visit! Choose from a vast array of decorative items, apparel, accessories, and one-of-a-kind art pieces! You can even style your own bottle of Coca­Cola®!